This is my favorite record of theirs and still stands as one of my all time faves period. This album really motivated me to find more "underground" music at a young age as I was blown away by how perfect it seemed to me. 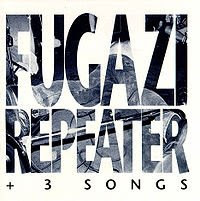 Where as I loved Faith No More I really connected to Fugazi. If that sounds cheesy than so be it. But I loved their whole DIY, screw the majors thing that they had going on. While Nirvana talked it Fugazi actually walked it. Every song on here is incredible but the ones that really get me are "Styrofoam," "Repeater," "Merchandise," and "Turnover." When I was 14 I thought that "Shut The Door" was just about the greatest thing ever created ever. The drums on "Repeater" still perplex me. I swear there are two drums tracks happening. This is one of the records that I taught myself to play drums to (by jacking up my headphones and drumming along) and Canty's drumming on this one is incredible. His style, just as much as Lally's, really makes the band. For me anyways.